This Italian-inspired indulgence is a coffee, (and chocolate) lovers’ dream. 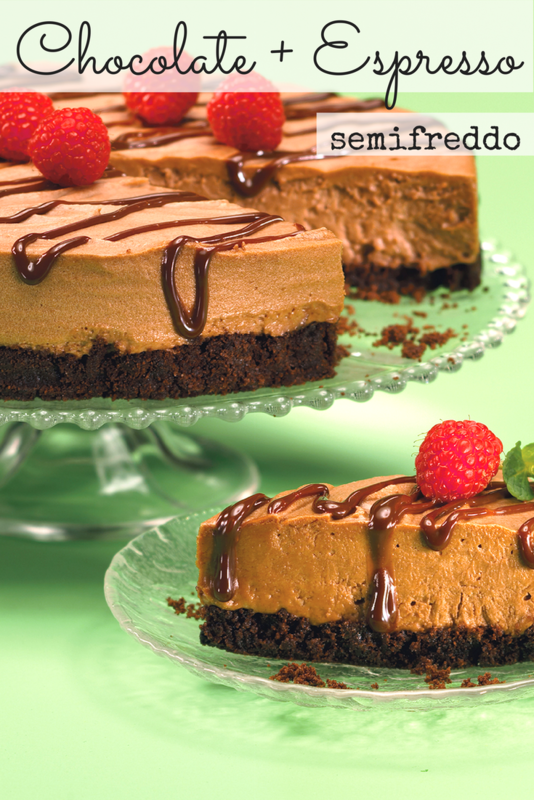 The perfect sophisticated dessert for your next adult dinner party is the Chocolate Espresso Semifreddo. 2. Lightly brush the bottom of a 9-inch springform pan with melted butter. 3. Combine the chocolate cookie crumbs and 3 tablespoons of melted butter in a small bowl, mixing with a fork until crumbs are moistened. 4. Pour the crumbs into the springform pan and create an even layer, pressing with the flat bottom of a dish or drinking glass. 5. Bake for 10 minutes and transfer to a wire rack to cool. Once cooled, line the edges of the pan with strips of parchment paper. 1. Over a double boiler, whisk the egg yolks and 2 tablespoons of sugar together. Lift the whisk out of the bowl as you go to incorporate air into the mixture. Continue whisking until the mixture is pale yellow and thick, with ribbons. 2. Add vanilla, rum and espresso. Cook over the simmering water until liquid coats the back of a spoon and the mixture is thick and foamy. Remove from heat and stir in the chopped chocolate. Stir until melted, and continue stirring until the mixture has cooled. 3. In a separate bowl, combine the mascarpone and heavy cream. Stir together until soft and smooth, taking care not to over-stir. 4. Combine the egg whites and the remaining 1/3 cup of sugar in the stainless-steel bowl ofa stand mixer. Gently whisk together over a simmering water bath until the mixture reaches 145°. 5. Remove from the water bath. Whip the mixture in the stainless-steel bowl on medium-high speed (using the mixer’s whisk attachment) until stiff peaks form. 6. Reduce the speed to medium and mix until the bowl is cool to the touch. 7. Fold the mascarpone mixture into the chocolate mixture until there are no streaks. 8. Fold 1/4 of the meringue into the chocolate-mascarpone mixture to lighten it. Gently fold in the remaining meringue in three parts, taking care not to over-mix and deflate the egg whites. 9. Spread the mixture over the crust in the parchment-lined pan, cover tightly with plastic wrap and freeze for at least 4 hours. 10. When ready to serve, loosen and remove the sides of the pan. Remove the parchment paper strips. Garnish as desired. 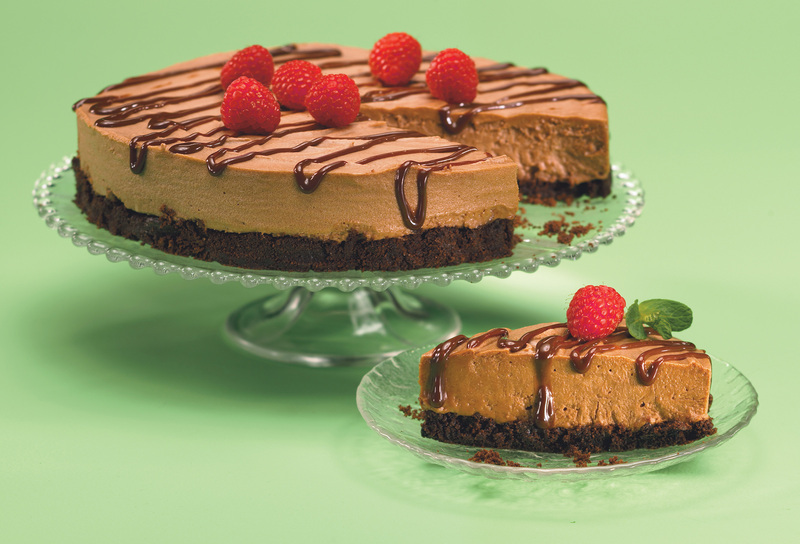 For more delicious desserts, follow our Pinterest board, Treats and Eats.